The City of Copenhagen has been on a 'charm offensive' since April 2010. The goal is to get more people to use the bike racks around the city's Metro stations, instead of leaning them up against everything else. Here's the simple trick. If you park your bicycle illegally, the City will move it over to the bike racks. Instead of finger-wagging, they will then oil your chain, pump your tires and leave a little note on your bicycle asking to kindly use the bike racks in the future. How brilliant is that? And the great thing is that the initiative has worked. 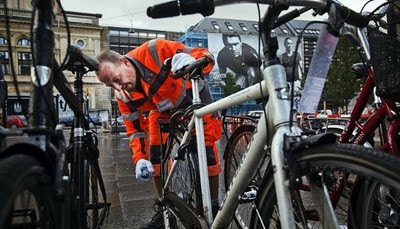 "It's about getting people to stop parking their bicycles in areas that emergency service vehicles need to access if there is an incident at a Metro station", said Project Leader Poul Erik Kinimond, as his colleague Morten Schelbech oils a chain in the background. Twice a day they move bicycles at the city's largest Metro stations. "We're been called "Bicycle Butlers". People really like what we do". When the project started in April they were moving around 150 bicycles a day. Today that number has dropped to between 30 and 50. "It's been a bigger success than I had expected. At the beginning I wasn't keen on rewarding people who parked illegally. The idea was to tackle the problem in a way that wouldn't make people angry because we moved their bicycles", sais Kinimond. "But we haven't had one single person who was angry", added Morten Schelbech. He doesn't think that people will begin to park illegally in order to get a free oil and air service. "We can recognize the same bicycles that are parked illegally several days in a row. They don't get oil or air." The "Bicycle Butler" project will continue until at least January, 2011.